We love Rocky Road so much we'll devour it any form it comes! Whether ice cream, bars or cheesecake, we can't get enough of Rocky Road's chocolatey goodness! 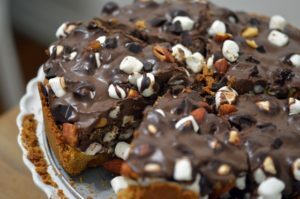 Here is another Rocky Road recipe in pie form: buttery graham crust filled with gooey chocolate filling. Enjoy! Preheat the oven to 350ºF. Add the graham cracker crumbs, salt, sugar and melted butter to a bowl and mix well. Press the mixture into a 9-inch springform pan. Bake for 15 minutes, set aside to cool. For the filling, melt 2/3 of the roughly chopped chocolate in a heatproof bowl over simmering water. Remove from heat and stir in the room temperature cream, then add the egg yolks and stir until everything is smooth and glossy. Stir in the remaining 1/3 chocolate, marshmallows and the almonds. Pour the chocolate mixture into the prepared crust and sprinkle marshmallows, almonds, and chopped chocolate on top. Refrigerate the tart for at least 2 hours, or until it is chilled and set.